When Melissa from Sew Bittersweet Designs put a call out for pattern testers I couldn't resist because the Flowering Lone Star is such a beautiful design. Those of you on Instagram will have seen my excitement a few days ago as I got a lot of perfect points - this was an easy accomplishment following Melissa's well written instructions. I have to be honest and say when I first looked at the pattern I thought 'oh no'! It looked like the cutting might be tricky and I was nervous about making a design that required so many points and some 'y' seams. I couldn't have been more wrong though, once I started cutting, and her cutting instructions are so easy to follow, I realised this is actually a quick top to put together. I gave myself a little challenge by using fat quarters rather than the recommended yardage because I fancied making a rainbow. This was easy too because the directions are so well laid out and I just cut the diamonds individually rather than from strips. I used eight fat quarters for the diamonds and coordinating solids for the edges. I got one noticeable pucker on the cheeky blue oakshott but I'm hoping I can quilt it out. The fat quarter fabrics were all from my stash of Pink Castle Fabrics that I collected from the monthly Stash Stack Club. I love the rainbow of colours! I'm going to quilt this and give it to my friend who has recently had a baby boy. 1. Leave a comment below, say anything you like! 2. Follow my blog (GFC, Bloglovin, Feedly, email etc - the buttons to follow are over there on the right) and leave a separate comment telling me you do (optional entry). 3. Follow Sew Bittersweet Designs and leave another comment (optional entry). **Warning: you will not win if you are a no reply blogger so please leave your email address in the comment. This actually happened in my last giveaway and I would hate for someone to miss out! The giveaway will close on 11th August, the winner will be chosen by random.org and Melissa will email you the pattern of your choice. See Melissa's post for more chances to win, the patterns are available in her Craftsy shop and there's a discount bundle if you'd like them both. *Also check out the free pattern from the Fat Quarter Shop in my last post. thanks for the chance to win, I love your rainbow version, it is really lovely! I really like the rainbow version of the star. It is so different from the others. clean and modern. I also follow you and love the pouch using the nailpolish. Now I know a pouch for manicure items, perfect for travel! Thank you for the giveaway. I love your version of the star. The rainbow of colors works so well with the pattern! I also follow you via Bloglovin'. 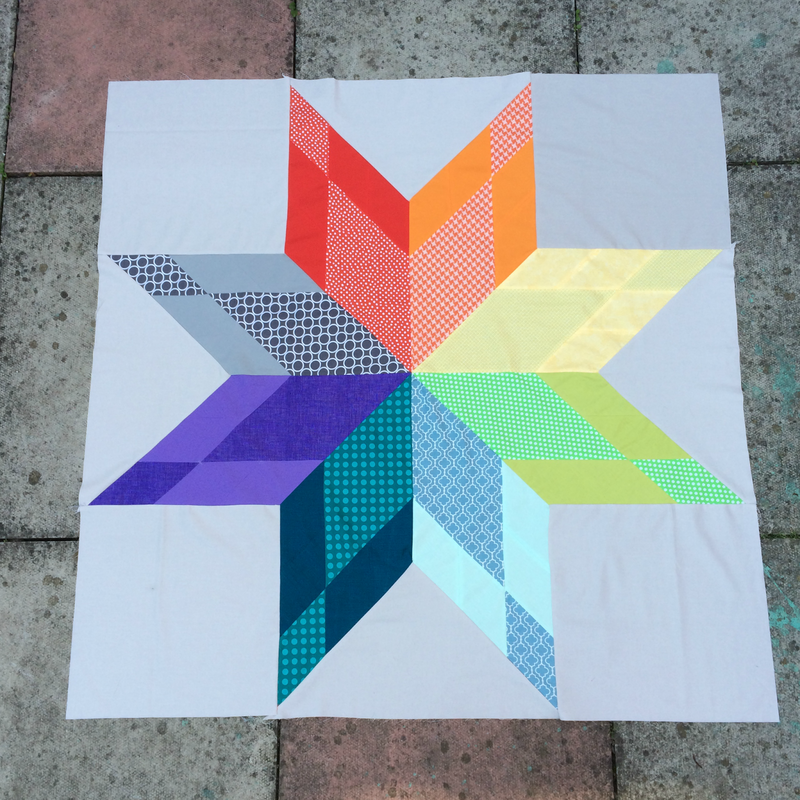 I love both patterns and your rainbow star is sure to be well loved. Oh, I really like how you chose to make the star into a rainbow of color. Lovely! I follow you using Bloglovin'! oh thanks for the chance - love the idea to use this for a baby boy quilt, sometimes I have such trouble with "boy" designs! All those quilts are gorgeous! I love your version Lucy ! and I follow Melissa too !! What a beautiful rainbow! I see inspiration for my sewing space! Oh, I'm in love with the flowering lone star version! Thank you for a chance to win. I have always like the lone star pattern... this is one I will have to try! I now follow Sew Bittersweet Designs on Bloglovin! I follow sew bittersweet designs on feedly too! I love this! Been wanting to make a lonestar for a while and this would be a good first step! I love stars, and your rainbow version is stunning. And I now follow SewBitterSweet by email. I wish I could have tested it as well, it looked so promising. And your rainbow version is awesome! The two tone colors are great! I love these stars you made. I especially love the Bursting Lone Stars. I love your rainbow star! Your star is fab! Great color combo you went with. I follow blog by way of email! I also follower Sew Bittersweet by way of email! I so wanna make this star!!! I love your rainbow version. What a great pattern, I didn't realise the size and thought it was a cushion at first! I need to learn how to do Y seams! Fantastic points! Thanks for the chance to win! I'm following Bittersweet Designs also! I love your fabric choices! Beautiful! I follow Bittersweet Designs by email also! I love Lone Star blocks and your is beautiful! Thanks! I follow you by Bloglovin. Thanks! Your quilt is beautiful! Wonderful pattern. I love Bursting Lone Stars too! I'm an old Bloglovin' follower of your blog! I really like the big one! Wouldn't it be cool to make one design on the front and one on the back? I follow Sew Bittersweet on bloglovin'. Love the Lone Star blocks!! Follow Sew BitterSweet by email too!! i was right with you on the pefect points high! lovely job! I am rather taken with the flowering lonestar pattern. Ooh! Rainbow big star! Be still my heart! Melissa is awesome, as are you! I also follow Sew Bittersweet Design! 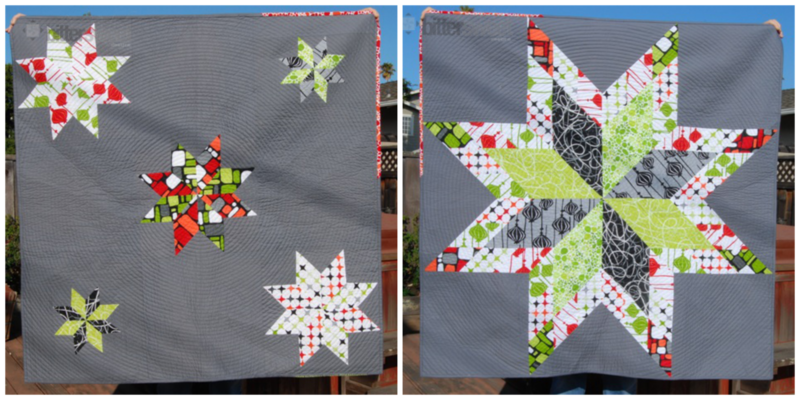 I was delighted to see your quilt this morning on Melissa's blog--two of my favorite bloggers coming together with fabulous results! I follow you via email, happily. I follow Melissa's blog via email. The quilt turned out great. Wonder how it would look in a pale blue background, like the sky? I love stars. I love your rainbow, it's very striking. I bought Mel's first pattern and this one is fabulous too. Lovely colours .... and enviable points. LOVE, LOVE, LOVE what you did with this pattern, Lucy! Gorgeous! Awesome quilt! you did a great job! FOLLOW MELISSA ON BLOG LOVIN'! FOLLOW YOU ON BLOG LOVIN' ! VERY NEAT LONE STAR PROJECT! THANKS FOR A PATTERN GIVEAWAY! I left a comment but it isn't showing. So I'll leave another comment...the rainbow lone star is beautiful. I love the rainbow colorway whether it is in 30's or brights or civil war fabric. It is like a scale on a piano. Perfect. Your nail polish bag is cute too! I'm already a follower of yours on bloglovin. I love that star design and the colours you have used. Wow, beautiful quilt! Would love to win the pattern. You are so right it looks a beautiful pattern ! Job well done and glad you are no longer in awe of y seams. What a wonderful Lonestar! Thanks for the opportunity! Cute star quilt. I'd like to make it for a baby quilt as well. Love the Lone Star pattern! I follow BitterSweet Designs by email! This is such a lovely block and your rainbow block is gorgeous and will look stunning in a baby's room. I am itching to have a go at this block myself. Oh, that's a pretty star, I'd like to have a go at that lone star! I've been dreaming of making one of these for a long time now, so it would be great to win one of these beauties! That lone star pattern is making me SWOON.